With botanical base of natural oils such as olive, sweet almond, apricot kernel and macadamia nut oil and then enriched with the nutrient dense fresh milk from diary sheep bringing a creamy quality. Petals, clay and extracts are used to blend individual varieties, fragrances are created from 100% natural high grade essential oils. Milk Lavender - Herbaceous Lavender essential oil blended with thick Patchouli to balane the floral notes. A beautiful bar to use in the evening before retiring to bed. Milk Orange and Ginger - With warm and smokey tones blended from pure Sweet Orange, Clove and Ginger essential oils. The slightly spicy scent of this bar is our most exotic. 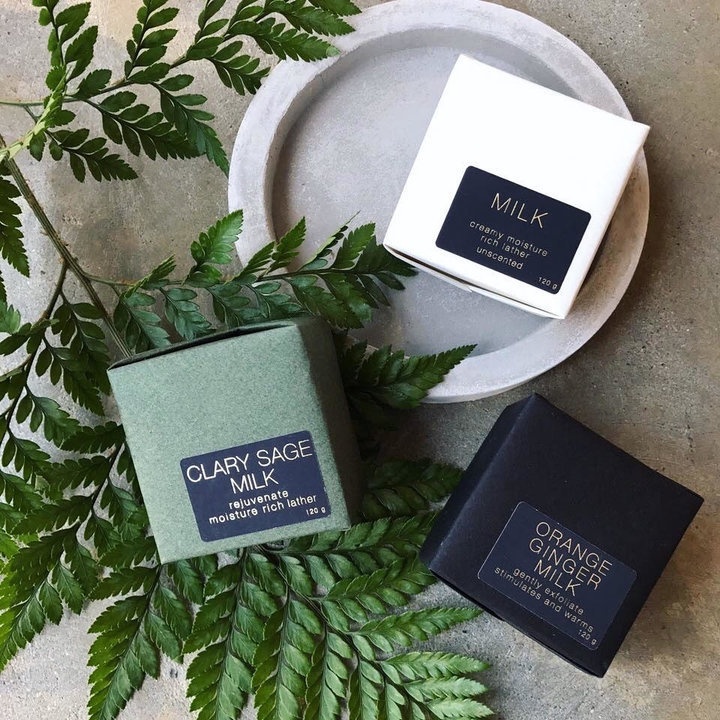 Milk (unscented) Free from essential oils, our unscented bar appeals to those who love their pure parfum uninhibited and for those who have sensitivities to essential oils.